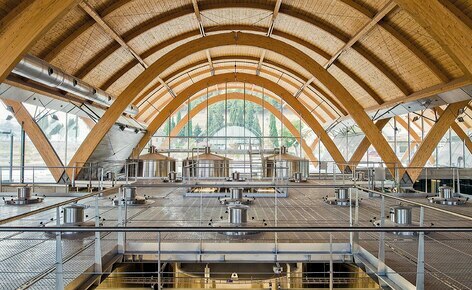 The warehouse that Bodegas Protos has in the towns of Peñafiel and La Seca required a software capable of managing the reception, storage, order preparation and shipments of a high quantity of bottles and SKUs. To achieve this, they have chosen Mecalux and the high performance its Easy WMS warehouse management software offers. Bodegas Protos is a Spanish wine company founded in 1927 after 11 winegrowers from Peñafiel (Valladolid) united. They created the first winery of what is currently known as the Ribera del Duero Denomination of Origin. As the years passed by and after experiencing strong growth, Bodegas Protos expanded throughout the entire region. They even built a wine-aging cellar right in the heart of the mountain behind the Peñafiel Castle to contain its proliferation. Each year they produce 6.5 million bottles, which are sold in more than 94 countries on five continents. Their work and dedication, combined with the quality of the product has brought Bodegas Protos to the pinnacle of international attention. The Bodegas Protos warehouse has a surface area of 19,450 m² and a maximum height of 7 m divided into different floors and sub-warehouses. Protos works with 6 and 12 bottle boxes, specific racks for aging wine, 2 and 3 bottle cases, etc. In order to manage the large stock that moves within the Bodegas Protos warehouse throughout the year, it was essential to optimise space. They have done so using a management software that keeps track of the exact location of each bottle produced, as well as the marketing of the same by regions. Apart from fulfiling storage functions, Protos also needed logistics, storage and supply chain consultancy to ensure quick, orderly and agile access to the material stored, as well as space optimisation. In addition, Protos produces bottles from wine reservoirs or barrels, which are stored and later issued in different case designs. This process became a problem, because the company did not have a real-time system capable of showing where and how many bottles were stored. Bodegas Protos has relied on Mecalux and its Easy WMS, directed by radio frequency terminals, to record all SKUs and control both the inventory and the locations of each SKU. Optimisation of warehouse processes: use the warehouse management system to accelerate tasks, optimise movements, reduce errors and improve monitoring of the daily operations of the warehouse. Unitary traceability of bottles: the traceability of each bottle produced and issued from Bodegas Protos was key. Therefore, the system is configured so that product is tracked throughout all processes, even indicating bottle numbering. Supplier receipts: raw materials are received from suppliers in full containers. If the containers are not tagged with a specialised label, they will be labelled upon arrival. Reception of loose stock: stock is directly received into the entry buffer and will be used for items that do not come from supplier containers. Location: both containers and loose stock will be placed in their location upon arrival. First, semi-finished product is made from raw material. The result is unfinished bottled wine, which is housed in the bottle racking. In this process, Easy WMS labels the containers. Second, the semi-finished product returns to go through a production process, where it becomes finished product. In this process containers are identified and the Easy WMS software makes a theoretical calculation of (from the beginning of production order) the amount of bottles each container holds. Replenishment: the picking area is refilled as stock is used up. This process is carried out manually by locations with assigned product. Dispatch of full containers: the allocation of full containers to dispatch (according to the indicated expedition logic), and the collection and delivery to the buffer zone. Given that there are specifically assigned containers comprised of bottles with specific numbering, this maintains the traceability of which bottles are assigned to certain deliveries. Picking: the process of separating the stock of a container to assign it to a specific delivery. In this process, the Easy WMS estimates the serial numbers of the bottles that are most likely to be collected. Dispatches: the shipment of stock prepared for a particular customer in the form of an order. To avoid errors, Easy WMS is responsible for labelling each dispatched container and the management of loading the truck. Returns: reception of previously delivered, finished product. Transfers: corresponds to stock transfers between warehouses. They are received as "exit orders" in the warehouse of origin. Once executed, Easy WMS creates the corresponding "entry order" in its program. In addition, transfers are made to warehouses that represent shops and are received automatically. Sales: when goods sell in the shops, a decreased stock message will be received from the ERP. This feature aims at maintaining the traceability of bottles. That is why changes are distributed throughout the production and dispatch processes, where the numbering of the bottles used must be indicated. This function also includes the management of numbering assigned to each container when it leaves production, for stock recounts, during consolidation and picking, at the time of delivery, etc. In order to see what has occurred with one or more serial numbers of bottles (and, thereby, the stock units that it represents), the user has the "Bottle traceability" screen. This screen displays the actions performed, based on configurable filters. For example, the date, item code, item description, bottle numbering, the governing council’s label, the batch, warehouse, warehouse destination, etc. Space maximisation: the Easy WMS warehouse management system increases storage capacity by up to 40%. Cost savings: in addition to better space utilisation, the Easy WMS also provides visible cost savings in other variables. Perfect stock control: Bodegas Protos uses real-time inventory to control all the items it warehouses.